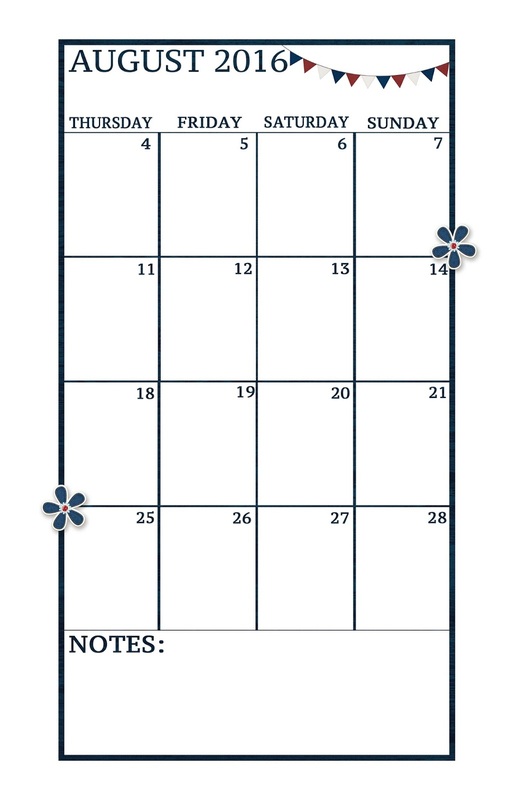 I've got your free inserts for August. 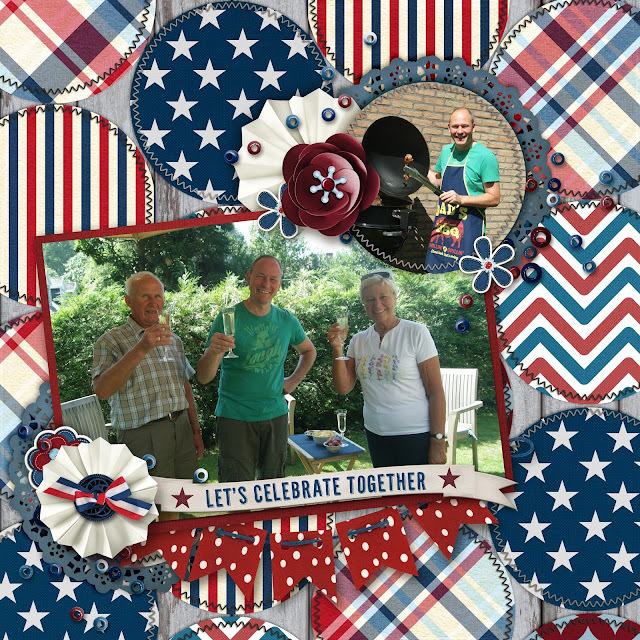 I'm using Paty Greif Digital Designer's collection, Celebrate Freedom. Here's a look at a layout I made using that collection and a Pink Reptile, free template. Keep reading and download those inserts. Sweet and simple this month with such cute doodles, too. Right click and download these inserts and enjoy. Remember, they are for Personal Use ONLY. I've got a couple of freebies for you, today. Check out some inspiration, see how you can use the free goodies and get scrapping! The first freebie is sponsored by MagsGraphic Designs. Maggie's got a new collection out, Ocean Cruise. I've teamed it up with a template from Lissy Kay, Picturesque. These bright colours are the epitome of vacation, baby. The banner and these flowers are so much fun. Maggie also has some great journal cards in the collection. You can see a couple of them in my layout, here. 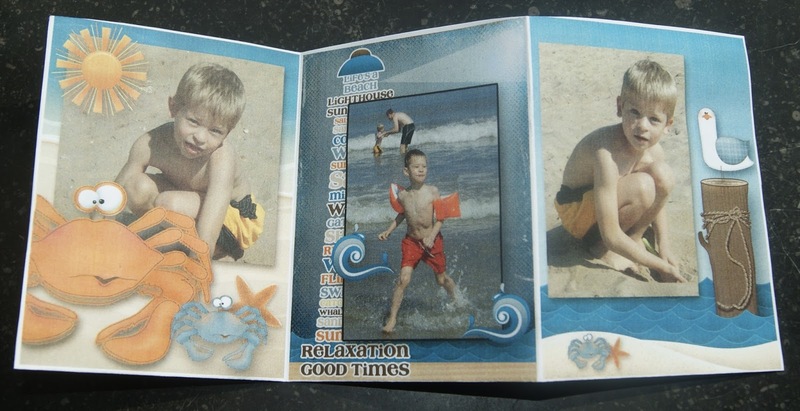 They'll be great for you Project Lifers or for making hybrid mini albums. I've whipped up a free border with the Ocean Cruise collection. 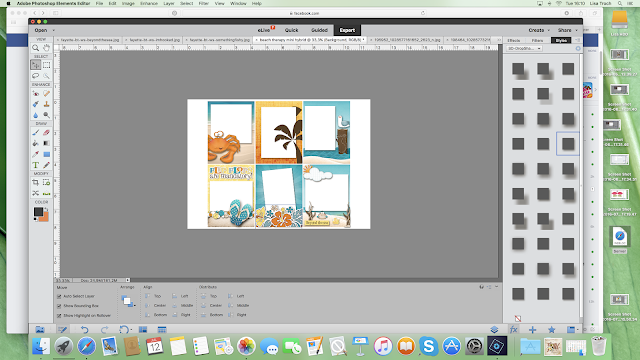 I used it in this layout. What a fast way to scrap up your photos. Add the border, back it up with a couple of your favourite papers from the collection and add a few elements here and there and you've scrapped! I've said over and over, that collections for both traditional and digital scrap, are THE best ways to scrap fast and easy. Here is the free border. I've got another way to use this baby hybrid style. Print it out, cut it out, laminate it and slap it in a book! 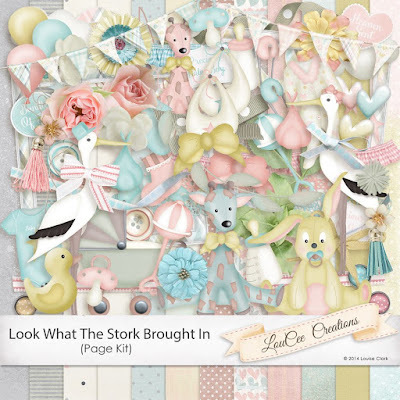 LouCee Creations has a gorgeous new kit out, today, too. Look What The Stork Brought In is so soft and lovely. 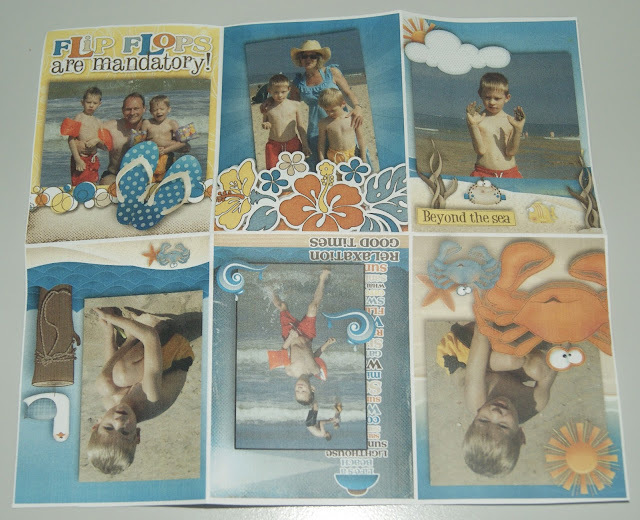 Lou also has several freebies you can grab via her blog and with a newsletter subscription. Click on the previews to get them. You can subscribe to the newsletter over on the blog. This blog is full of sweet freebies. Take a scroll through and see all you've missed or visit our Pinterest board, The Cherry On Top's Freebies. 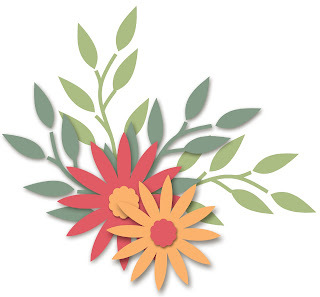 I've got a fast, easy and inexpensive paper/hybrid project for you. 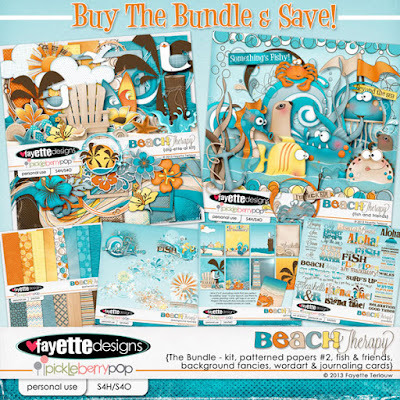 I'm using this totally awesome collection, Beach Therapy from FayETTE Designs. You can find it at Pickleberry Pop. 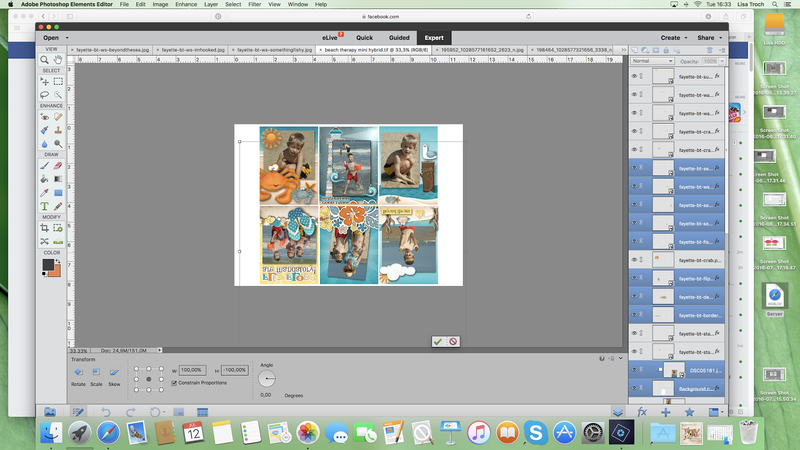 Keep reading to see our step by step tutorial on how you can build a fantastic mini scrapbooking album on just one piece of paper. All you need is your software, your digital goodies, printer, paper, scissors and glue. You don't even need fantastic paper. In fact standard paper or lighter weight paper might be even more ideal. I was stunned at the quality of print FayETTE's designs delivered. I used standard printer paper and I forgot to use my "fine" print selection because I was so excited to see the result. Hehehehe....and it still turned out fabulous! Here is what the collections looks like. I fell in love with the journal cards and knew right away what I wanted to do with them. I understand that not everyone finds as much time as I do to scrap. So, I look for projects that you can finish with an hour. Let's get started with the tutorial. It's really a breeze! I chose a format that would print easily on any printer. On my Brother printer, it is Internation/ A4, but there is also an American selection. I want my mini to fit on a standard piece of paper just for the ease of it all. I slid in SIX of the cards without having to adjust the size of the cards where 3"x4", I think. They fit so nicely on my format. If it doesn't fit on yours, select all six and adjust them at the same time so they are exactly the same. Centre them nicely on your page as shown. 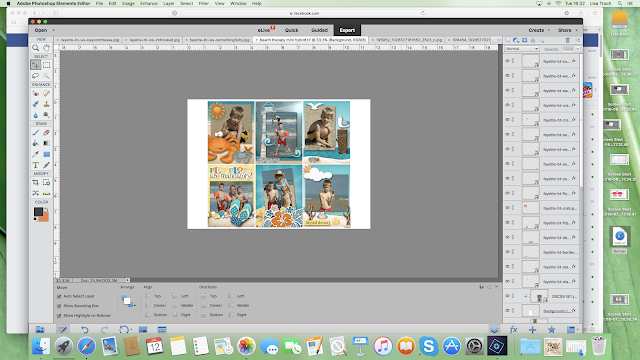 For me, the easiest way to get my photos on a digital page is to create a template for each image or photo. 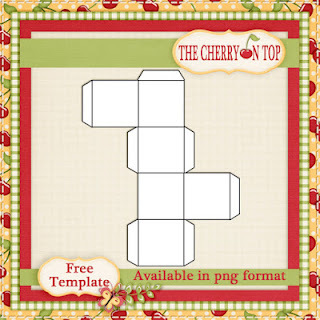 To do this, click on your layer "background" and duplicate it, then size it or cookie cutter it to the shape and or size you need. Do it for each image you want to insert, as shown below. (Not sure why my first photo spot is looking like that. )This technique will save you from all of the cropping and recropping and sizing you may have to do before your photo is just right where you want it, the size you want it. Once you've inserted all of your photo spots, drag in your photos, command G or select "create clipping mask"from the layers in PSE. 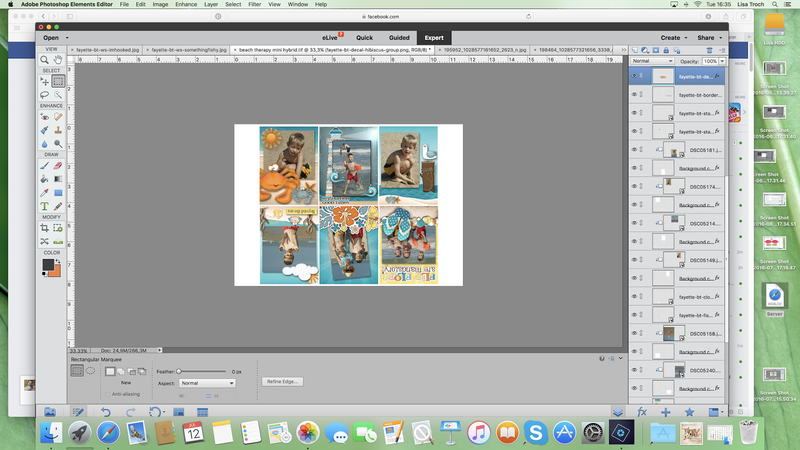 The next, if you so wish, is to get the same elements from the card and place them exactly or slightly larger as they are on the originals. You can see I've done the big, orange crab. I also put a shadow under it to keep the dimensional effect. Go around from card to card, playing and sizing the elements. (I'll eventually change that palm tree card.) Take note of the last card. It's one that I changed up a bit so my photo would fit better. I moved the fish and put a more fitting text banner over the existing one. There it is! I've changed out the top middle one where I could clip in a larger photo. Here is where it may get tricky. In order to just be able to fold the bottom row under and glue, you'll have to click on the all of the items in the bottom row and change it both horizontally and vertically. Keep reading to see what I mean. If you look to the right, you'll see I've highlighted everything on the bottom row. I click on one of the boxes in the marching ants field and then can right click and choose, "Flip Layer Horizontal". It will appear like you see below. Tip: You won't be able to read your text easily, backwards. So you know it won't turn out right when you flip it. Once you've changed it horizontally, also change it vertically with the same method as explained above. You can see below, what I mean. See now, how you can easily read backwards? This is what it looks like, printed out. The colours are not that much different than the image above! I highly recommend pre folding or soft folding everywhere you need a fold so that when you glue the layers together, it goes automatically into place and you only need to add a bit or pressure and perhaps make a few slight adjustments. Tip: I used a glue stick because it is more dry. If you use liquid glue on thin paper, it may appear wobbly or bubbly from the wetness. This glue stick dries very quickly and doesn't leave my paper, too wet. I tried so darn hard to cut my edges just right and I still messed it up! Hehehe... You could always just cut off all of the white edge to remedy this. Here is the other side. Pretty cool, right? Made in a flash, with little materials and a super result. 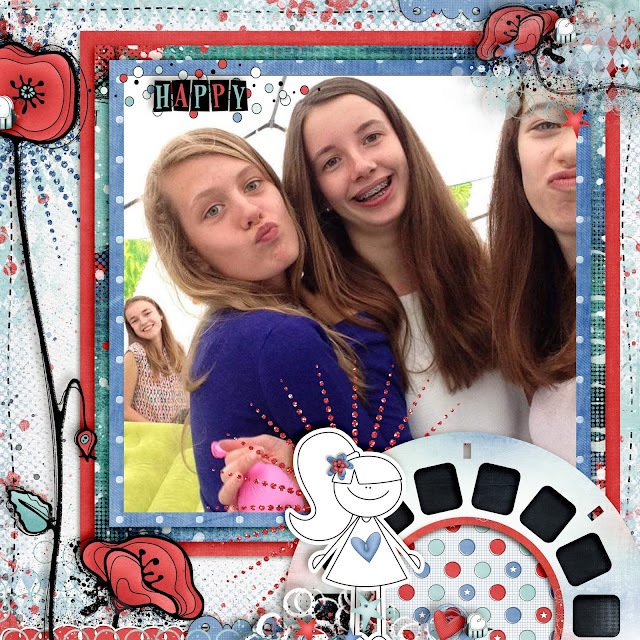 Check out what else I made with this beautiful collection. 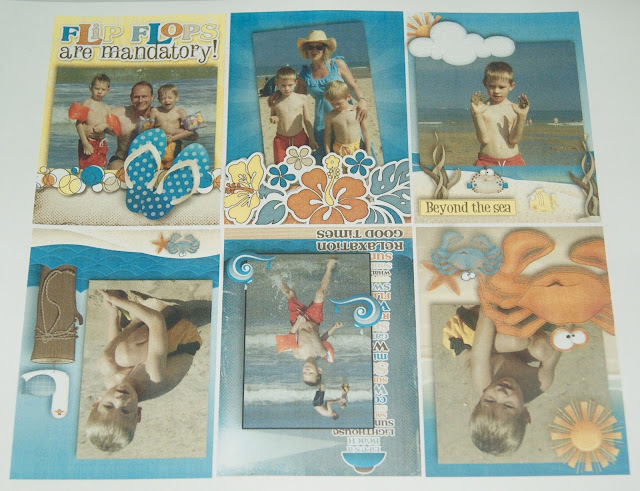 Here are a few more layouts with other collections from FayETTE Designs. And my favourite collection that I've worked with so far, Sunshine On My Shoulder. If you like FayETTE's designs as much as I do and you want a sample, I've got a freebie on a previous blog. Click any image to see the collections and get the freebie. Thanks so much for stopping by our blog. Consider joining so you don't miss a beat or a freebie. 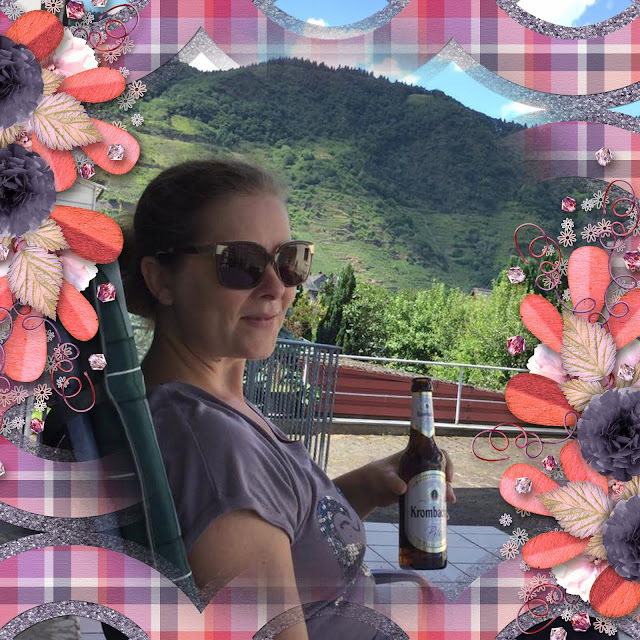 You may also want to consider join our group on Facebook where I offer exclusive freebies, have daily challenges and we get into some really good chatter, too. 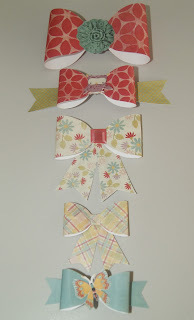 Our newest exclusive freebie is this template to make either digital or hybrid bows like these. 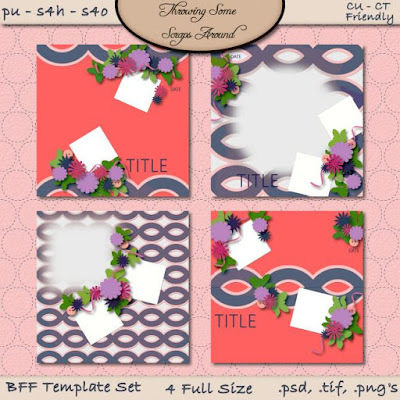 I've got my gal Jodi at Throwing Some Scraps Around back in the spotlight with a beautiful kit and some new templates all coordinating to make the collection, BFF's. 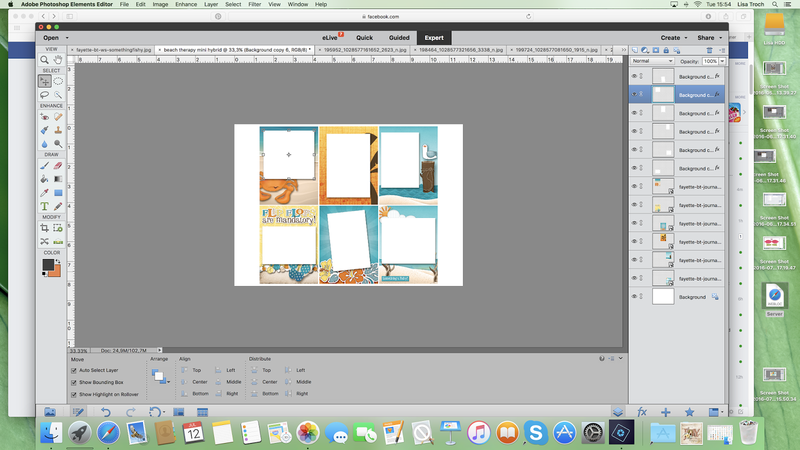 See her new templates and grab a tiny free one from me. I've scrapped up some lovely pics from friends of ours and their lovely girls. This is also an example of Jodi's new templates. Gorgeous, eh?! 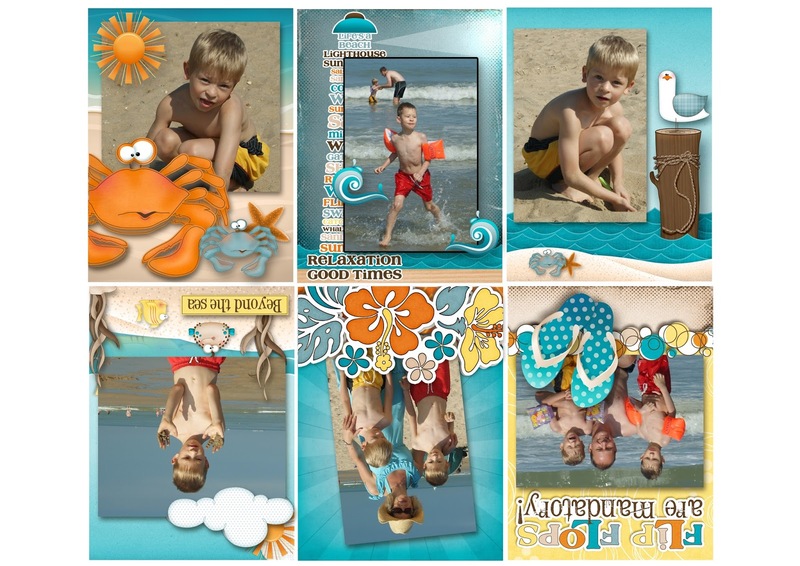 Keep scrolling to see more layout love, Jodi's templates and grab that freebie to try out, if you never used a template before. I've also got several links to help you find out how to use digital templates. You won't believe how easy it is! This is the BFF kit and a template from Heartstrings Scrap Art, A Little Bit Arty 5. 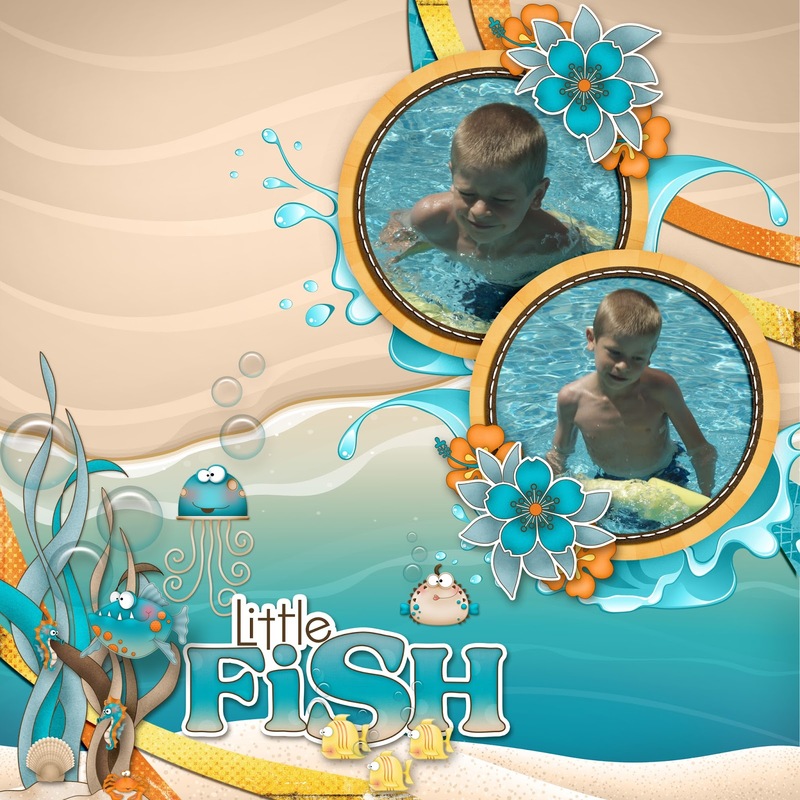 Jodi's blog, Facebook Page, Facebook Group and all of the layouts above and this preview is linked up to her shop +. Her prices are really amazing. You have to check them out and see for yourself. Here is your little free template to try out. I've included shadows for you. In PSE, you can copy the shadows. Click here to find out how. I've got several blogs dedicated to helping beginner digital scrapbookers and of course, I provide tons of freebies as well as links for even more free digital stuff. This way you can started for no cost. If ya love it at The Cherry, then you have to join our group on Facebook. 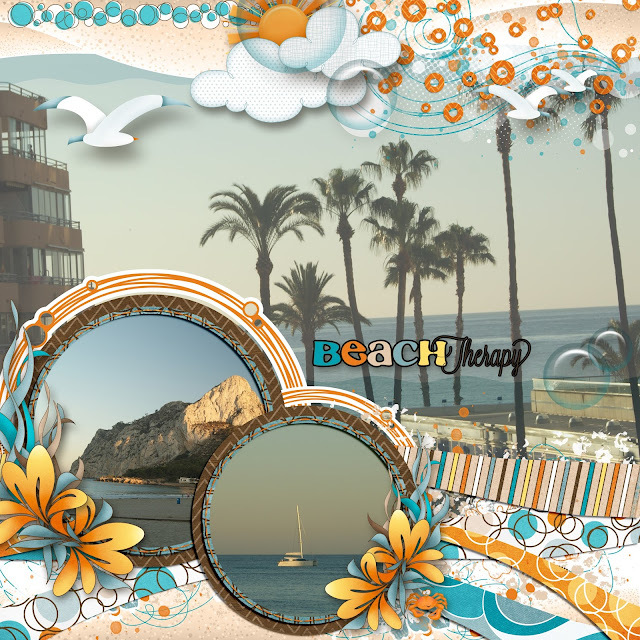 We have such a blast there and I've got two exclusive freebies for the group, already for the week. Head over and join us. 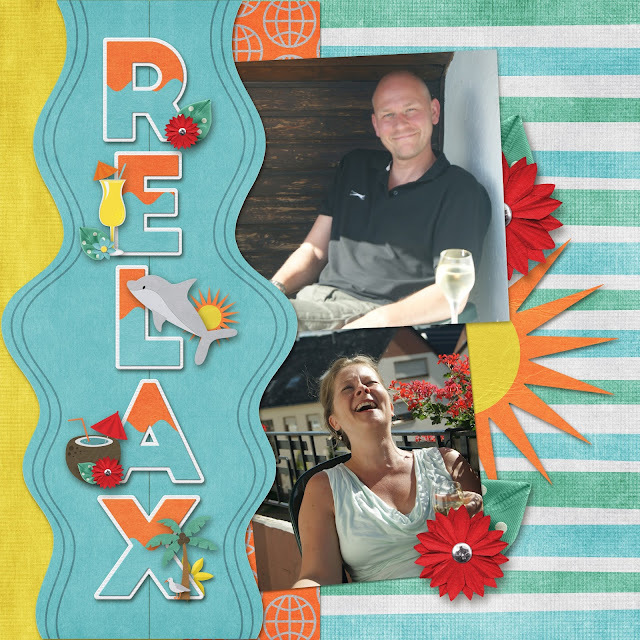 It's a super place to show off your lovely layouts, paper products and get inspiration. Some of the ladies who post there are just amazing. You'll see all different levels of expertise. There is so much to learn and we have a lot of fun along the way. Come back for a visit tomorrow and check out my really fast easy, hybrid mini. You can have a super cute accordion mini made in about an hour from start to finish! How's that for Throwing it back on Thursday? Ha! 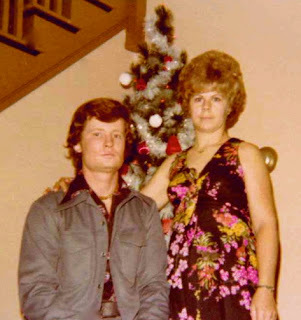 My parents in front of our tree with their best polyester. Hehehe... 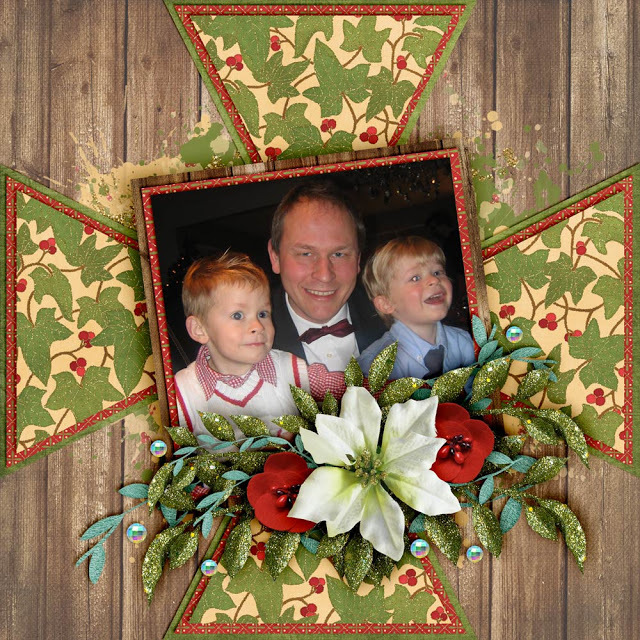 I chose a Christmas photo for today's TBT, because we are looking at Christmas goodies that are on a super promotion at The Digital Scrapbooking Studio. I cringe just a little at Christmas in July. Not because I don't love Christmas, but it's been really chilly here in Belgium, all summer and spring and I'm still trying to get over the winter blues. Hehehe...I absolutely love scrapping up Christmas pages and other products and projects for Christmas. 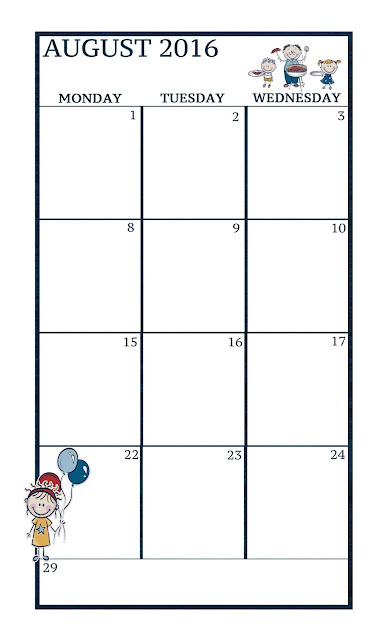 Many of us crafters have even begun starting our calendars, mini albums and gift ideas for Christmas. 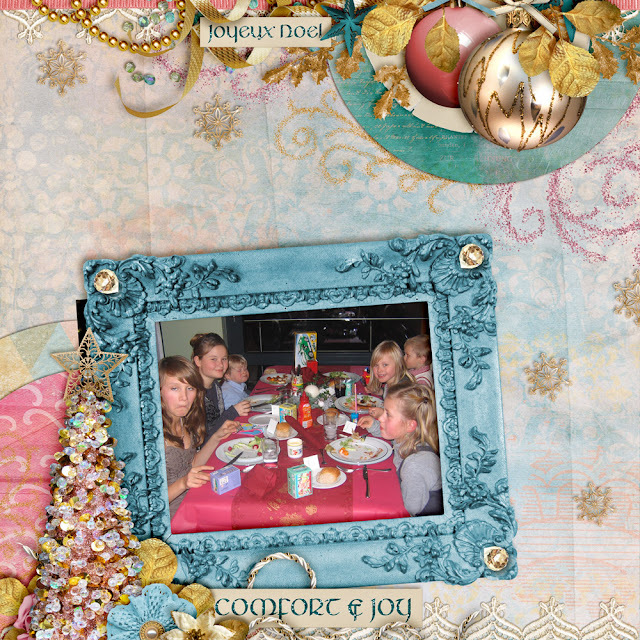 What better time than to take advantage of huge sales on Christmas products at the Digital Scrapbooking Studio! I've seen product as low as .50 cents and $1! Choose from a huge variety of kits and commercial use, many under $5. These are my kind of prices. Hehehe...And maybe you'll be done with your gifts, ahead of time. 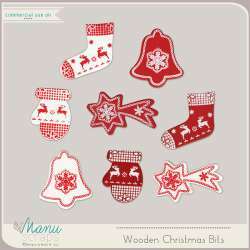 Christmas in July sale at the Digital Scrapbooking Studio. Keep scrolling to see some layouts using goodies from the current and month long promotion. That's not all! 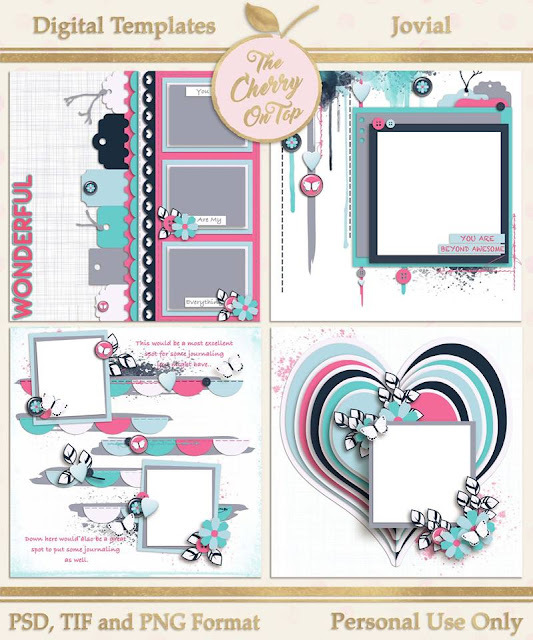 I've also got links to the freebies I promoted when these kits first came out. 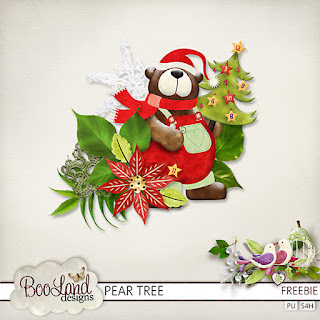 I've also got links for more fabulous free stuff from the Studio's super newsletter and from the forum where they are in the middle of a Christmas In July Challenge fest. I had a blast last year in the forum and you'll love it, too. There are so many freebies to be had. 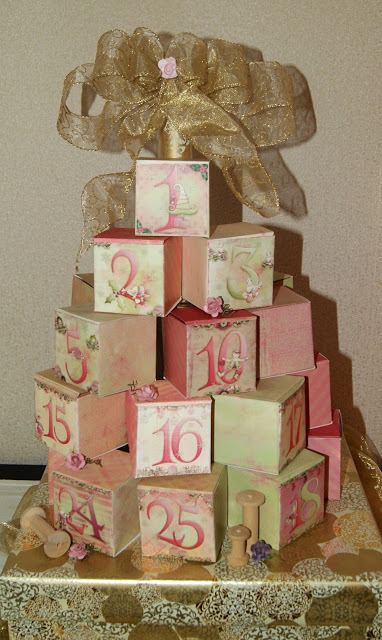 Above is an absolutely stunning collection from WendyP and Key Lime Digi Designs, Dazzling Christmas. Dazzling, indeed! Such a luxurious colour palette! Below is Aimee Harrison Designs, Comfort and Joy. Another dreamy colour combination. More gorgeousness with Over The Fence Designs', Glitter and Glass. If you note, I didn't even use Christmas or winter pics, that's how versatile this kit is. 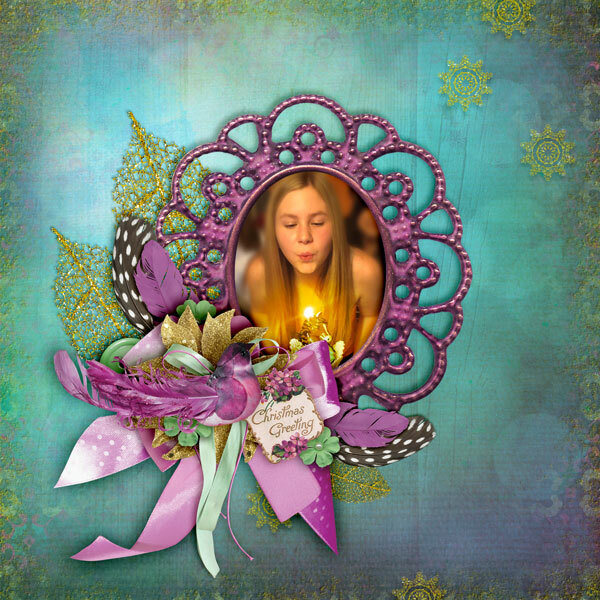 Heartstrings Scrap Art has several templates to choose from at unbelievable prices, too. This is from Patch Works. Click on any of the images to get to that collection. 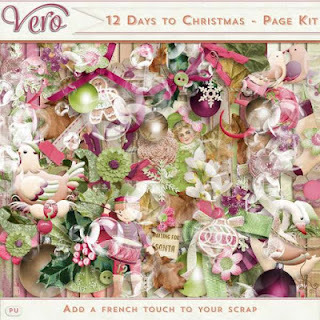 Another favourite collection you can find for an unbelievable price is 12 Days of Christmas from Vero. I designed a template so you can also make boxes like this and insert any digital papers you like. 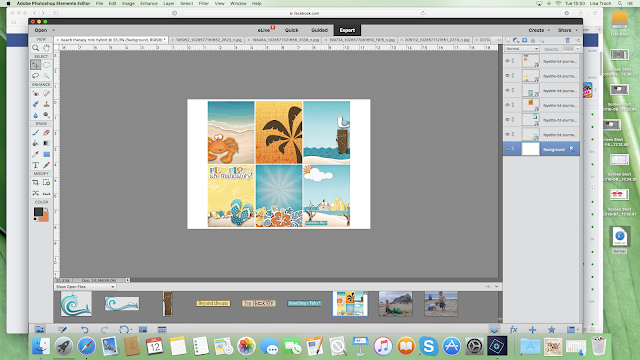 Of course, you can also use it for traditional projects. Click on the preview of the freebie, a bit lower. Oh, My Dear! What an adorable kit from LouCee Creations. 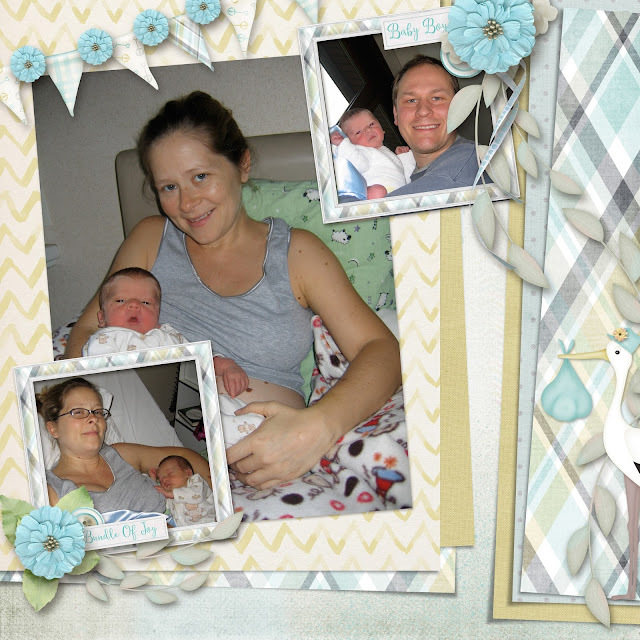 I designed this template and put in one of my favourite photos of my boys. I've also got the links from the free frame cluster pictured here. Scroll further to get it. This is the freebie from previously. 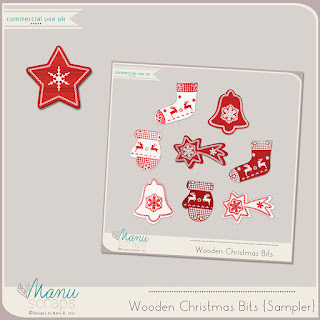 There is also Commercial Use on promotion at the Digital Scrapbooking Studio for the Christmas in July sale, like these nifties from Manu Scraps. 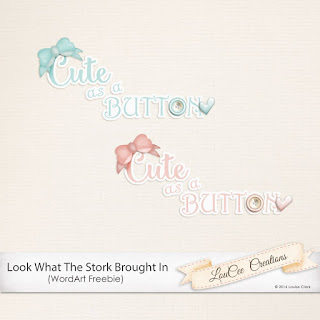 If you are subscribed to the newsletter from the Studio, you received this free Commercial Use along with two other lovely freebies. 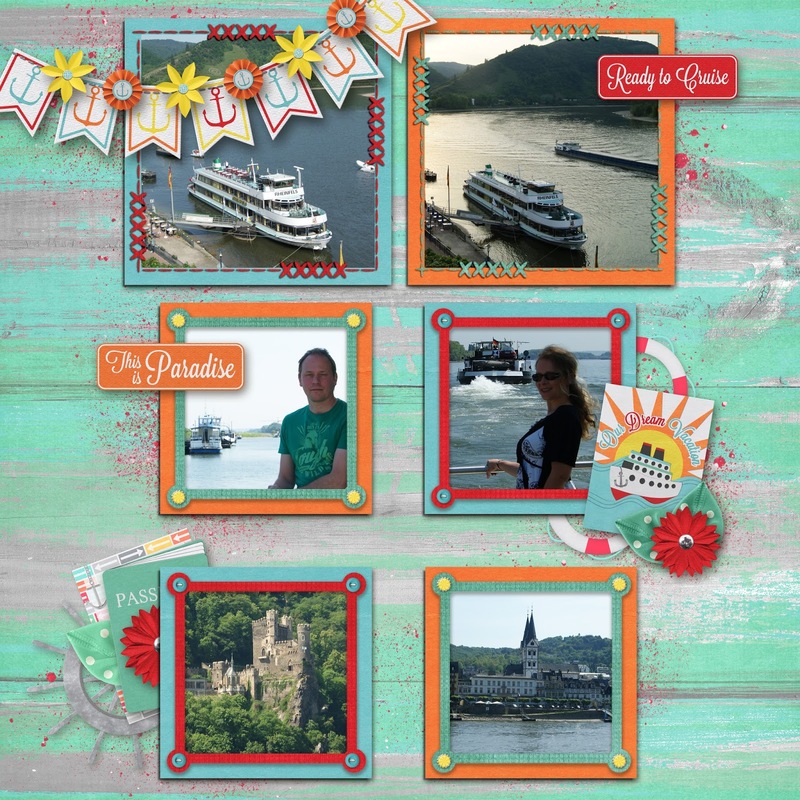 Click on the link below to see the newsletter and consider subscribing to one of the best newsletters for Digital Scrapbooking. Here's another freebie from the newsletter. 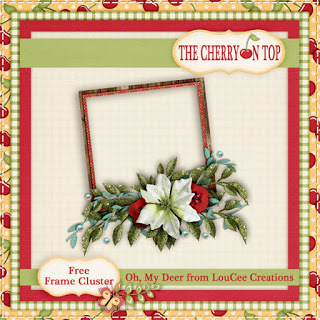 Here's your freebie from The Cherry thanks to the generosity of Over The Fence Designs. Remember all of this lovely free stuff is for Personal Use Only. Thanks so much for popping by our blog. It's full of sweet freebies and inspiration. We invite you to take a stroll through past blogs and consider following us here, on Pinterest or joining our fantastic, new group on Facebook. We get into some lively chatter, share all kinds of free stuff, including exclusive freebies and show off our lovely layouts and projects. We'd love to see ya there!